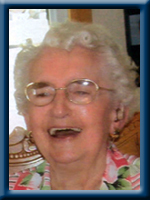 CROWELL – Florence Eleanor, 93, of Clark’s Harbour, Shelburne County, passed away suddenly on Wednesday, August 27, 2014 in Queens Manor, Liverpool. Born in Clark’s Harbour, she was a daughter of the late Leroy and Lydia (Swim)Swim. Mom was a member of the United Baptist (Stone) Church, Clark’s Habour, the WMS, a life member of the Canadian Bible Society, the longest member of the Sea Breeze Rebekah Lodge #24, where she was past Noble Grand and received her 60 year jewel and a member of New Horizons Senior’s Club of Clark’s Harbour and Port Mouton. She canvassed for many charities, sewed, knitted, loved playing 45’s, loved the Blue Jays and took several bus tours. She is survived by her daughters Alice Mary (Vernon) Graves of Marion Bridge, Cape Breton, Louise (Robert) Swain of Port Mouton, grandchildren Christine (Patrick) Saunders of Gander, NL, Peter (Jordanna) Graves of Toronto, ON, Andrew (Marjorie) Graves of Marion Bridge, Cape Breton, Nancy (Dane) Grant of Hebbville great grandchildren Emma and Ethan Saunders, Jack, Caylen and Bryden Graves, Lydia and Sam Graves, Eoghan Grant, sisters Sybil Newell and Barbara (George) O’Rourke, both of USA, brothers Wentzell of Newellton and Clifton of Port Mouton. She was predeceased by her husband of 43 years Lewis, sister Irma Newell and brother Waldo. To Louise, Clifton, and the rest of the family we send our sympathy. Hold onto those memories. Louise and Bob…We were all saddened to hear of your Mom” s passing.Our thoughts and prayers are with you,Her memory will always be in your heart. I was saddened to learn about your loss. Take comfort in your memories. Our thoughts and prayers are with you at this time. I’m so sorry to hear of your loss Nancy, and your family. my Dad recently. God bless you all at this difficult time. I am sad for you, but happy for Florence. She isin a far better place where she can find laughter and no pain, She can be with the people she has missed for so long. She was quite a lady who loved to have fun. My deepest condolences to all the family. Alice Mary and Louise I am so sorry to hear of the loss of your mother. I remember her well. What fun times we had when we were small. We were saddened to hear of Florence’s passing.We only knew her since going to Stone Haven,but she was a very pleasant lady and very nice to talk to.Our condolences to all the family from, Walter and I.
Heartfelt sympathy on the passing of your dear Mother Florence. Be strenghtened & consoled from your many memories. I was granted the gift of knowing your Mom in my younger years and remember her beautiful smile. My Mother Winnifred Maxwell and Florence were great friends in their growing up years in Clark’s Harbour. Louise & family, we were very sorry to see that your mother has passed away. Sincere condolances to you and all of Mrs. Crowell’s family. Ivan & I would like to send our condolences to the family. recently. God bless you all at this difficult time. Dear Alice Mary and Louise, Carol and I want to extend our sincere sympathy over the death of your dear mother. May you find comfort and strength from the promises of God’s word and may his grace be sufficient for your every need. Louise and family, my sincere sympathy. Clifton and family: My sincere condolences for your loss. Thoughts and prayers are coming your way Louise and family.